“The Attacks of the PAN…” What’s missing from this picture? It’s a headline that should set off alarm bells for any genuine revolutionary. The attacks on the working class by the PRI (Institutional Revolutionary Party), which ruled Mexico with a heavy hand for seven decades and still controls many state governments, and by the populist nationalist PRD (Party of the Democratic Revolution), which often poses as a friend of the working people – that’s what’s absent here. 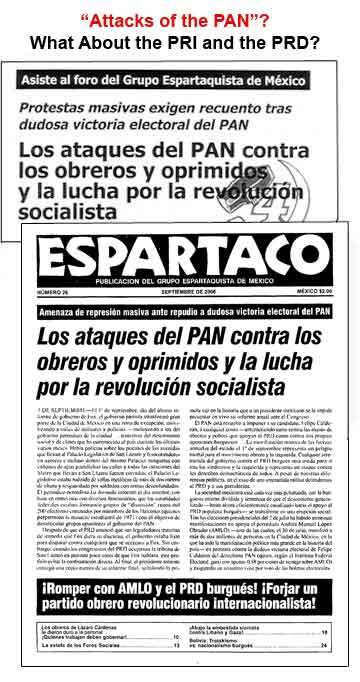 By focusing on the “attacks of the PAN,” to the exclusion of the other capitalist parties, the Espartaco headline is a crude attempt to sidle up to the huge numbers of PRD supporters who massively demonstrated and camped out for weeks in the center of Mexico City to protest apparent electoral fraud robbing their presidential candidate, Andrés Manuel López Obrador, of victory and handing it to the PAN candidate, Felipe Calderón. For the past six months, the Mexican working class has been the target of a series of murderous assaults by the forces of “law and order.” April 20: strikers occupying the Sicartsa steel mill in Lázaro Cárdenas, Michoacán, attacked by 1,000 local, state and federal police and marines; two workers executed. May 4: Texcoco/Atenco, near Mexico City, flower sellers (!) arrested and their defenders set upon by 3,000 local, state and federal police; two youths murdered. 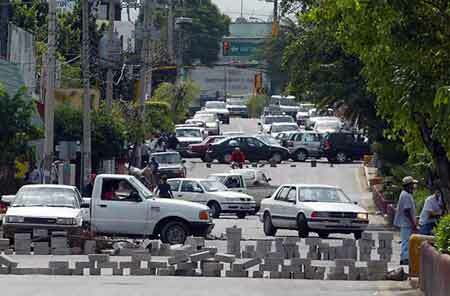 June 14: striking teachers camped out in the state capital of Oaxaca attacked by an army of 3,500 riot police; in the aftermath, five strike supporters killed. The Mexican working class is under attack, all right, but to sum up these massacres as “attacks of the PAN” is a gross distortion, and ultimately a lie. “The Attacks of the PAN” – as a spokesman for the League for the Fourth International remarked in an August 19 forum of our Mexican section, the Grupo Internacionalista, attended by virtually the entire membership of the GEM, this headline is “a gift,” for it explodes the Trotskyist pretensions of the GEM and reveals its real politics. This sleight of hand is a classic opportunist gambit, where ostensible revolutionaries rail against the most openly reactionary forces in order to justify veiled support for the supposedly “progressive” capitalist party. Similarly, opportunist leftists in the United States refer to the invasion of Afghanistan and Iraq as “Bush’s War,” thereby exonerating the Democratic Party which also supports the bipartisan imperialist war. The generic name of this strategem is “fight the right,” and it is a staple of Stalinist and social-democratic reformists who want to ingratiate themselves with the masses who follow a popular bourgeois party without openly supporting it. Currently in the U.S., in the lead-up to the 2006 mid-term Congressional elections, the Maoist-Stalinists of the Revolutionary Communist Party (RCP) – via their front group, The World Can’t Wait – are holding marches to “Drive Out the Bush Regime” that are explicitly geared to attract “disappointed Democrats.” Another variation on the same theme is a conference by the social-democratic International Socialist Organization (ISO) titled “Build the Left, Fight the Right.” Yet despite the “socialist” and even “communist” references in the names of the sponsors, these are all placed in the left-right framework of bourgeois politics. By singling out the Republican right, they are implicitly (and deliberately) appealing to “left” Democrats. Ditto for references to the “Attacks of the PAN” in Mexico. “Attacks of the PAN”? In Lázaro Cárdenas, Michoacán, police forces under the command of PAN (federal), PRI (local) and PRD (state) all participated in assault on strikers occupying Sicartsa steel plant; two workers were executed. In the United States, this ploy was made famous by the Communist Party in the 1936 presidential election when the CP ran its own pro forma presidential candidate (Earl Browder) while telegraphing to its supporters to vote for Democrat Franklin D. Roosevelt in the name of “combating this reactionary bloc [of the Republican right wing] and defeating its plans.” Declaring that a “People’s Front … will develop in the form of progressive movements inside and around the Democratic Party,” the CP denounced the attacks of the right on the workers, while remaining silent about the attacks by FDR. The popular front is a class-collaborationist coalition chaining the mass organizations of the working class to sectors of the class enemy by means of an alliance with bourgeois parties and politicians. In the Spanish Civil War of 1936-39, the Chilean Unidad Popular government of 1970-73 and elsewhere, Stalinist and social-democratic reformists have erected popular fronts as dikes to hold back the struggle of the workers until it comes time for a Franco or Pinochet to massacre them. And for nearly two decades, as the decaying one-party regime of the PRI-government has come apart, Mexico’s capitalist rulers (and their U.S. imperialist patrons) have required a popular front to act as a roadblock to revolution. Today they need it more than ever. The ICL has been moving to the right for some time, moving from abstention from the class struggle to abandonment of key programmatic tenets of Leninism and Trotskyism. Its dysfunctional Mexican section, under orders from its center, sat out most of the 1999-2000 National University (UNAM) strike and has been next to invisible in four months of labor insurgency in Oaxaca. But in the heat of the convulsive class battles that have shaken Mexico this year, their torturous formulas have led them to imitate classical popular-front politics, and worse. In attempting to force an American framework on semi-colonial Mexico, pretending that the corporatist labor bosses appointed by the capitalist state are just a bunch of sellout union bureaucrats like the Teamsters’ Jimmy Hoffa, they end up apologizing for “labor” death squads that are literally killing strikers. In the aftermath of the recent (July 2) Mexican presidential election, up to 2 million people came out at the call of PRD standard-bearer López Obrador, widely known by his initials AMLO, to protest election fraud. For six weeks, a huge megaplantón (encampment) of AMLO supporters occupied the Zócalo, Mexico City’s central plaza, and several miles of the elegant main avenue, Paseo de la Reforma. Various pseudo-Trotskyists such as the Militante group (which claims to be the “Marxist” wing of the bourgeois PRD!) and what remains of the PRT (which called to vote for AMLO) joined the plantón. Others like the LUS (Socialist Unity League) and LTS (Socialist Workers League) which didn’t formally call to vote for AMLO quickly climbed aboard the “anti-fraud” train. How so? Espartaco writes: “According to them [the Grupo Internacionalista], the principle obstacle in Mexico to workers revolution is a fantasmagorical ‘popular front’ around the PRD.” The tiny Grupo Espartaquista may not “recognize” the popular front in Mexico, but precisely because of its willful denial of this reality, the GEM has been sucked into the wake of the political alliance that chains large sections of the working class to the bourgeois populist candidate López Obrador and his party. The Grupo Internacionalista, in contrast, fights to break the workers and oppressed from the AMLO pop front. Going back to the 1988 election, a popular front coalesced around the candidacy of Cuauhtémoc Cárdenas to siphon off the burgeoning workers’ resistance to the starvation and privatization policies implemented by the PRI government on behalf of Wall Street and Washington. Over the years, this front tied various “independent” unions to the PRD, which was founded by Cárdenas supporters from the PRI and a panoply of leftist groups headed by the remnants of the now defunct Communist Party of Mexico. The popular front was not limited to electoral support but also took the form of various coalitions against privatization, for national dialogue, against neo-liberalism, for democratic transition, etc. including the same cast of “independent” unions and AMLO’s Party of the Democratic Revolution. Far from being “fantasmagorical,” the popular front around the PRD could be seen graphically in the streets of Mexico City of late. In the megaplantón along Reforma there was one tent after another of the SNTSS (National Union of Social Security Workers), STUNAM (National University Workers Union), SITUAM (Union of Workers of the Autonomous University of Mexico), CNTE (National Coordinating Committee of Educational Workers), SUTIN (nuclear workers), National Bottlers Union, Union of Workers of the Federal District, National Alliance of Democratic Oil Workers, Trade Unionists for Democracy, etc., many with their union symbols next to that of the “Coalición por el Bien de Todos” (Coalition for the Good of All), the electoral vehicle for AMLO’s candidacy (see photos). If that were not enough, on September 16 the mammoth National Democratic Convention in Mexico City’s Zócalo called by López Obrador proclaimed a Broad Progressive Front (FAP – Frente Amplio Progresista) including the PRD and the PT (Party of Labor, a minor bourgeois party set up by the PRI to harvest workers votes and now aligned with AMLO), with the support of the SME (electrical workers), the STRM (telephone workers), and various unions affiliated to the overlapping labor federations UNT (National Workers Union), FSM (Mexican Labor Federation) and FNUAS (National Front for Trade-Union Unity and Autonomy). The popular front around the PRD is not only very much alive, it is a principal obstacle to victory for the Oaxaca strike as leaders of the teachers’ union (Section 22 of the SNTE/CNTE) and the Popular Assembly of the People of Oaxaca (APPO) have given “tactical” political support to the PRD. 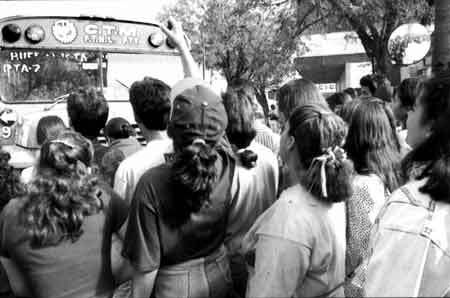 For almost a decade after 1988, from its very inception the GEM called on Mexican workers to break from the popular front around Cárdenas and the PRD. Today it does not. Why not? Espartaco argues, “The GI invokes the existence of a popular front around the PRD to prettify the present consciousness of the working class, denying the fundamental ideological obstacle of bourgeois nationalism and illusions in the democratic reform of the capitalist state.” According to the contorted reasoning of the ICL, calling on Mexican workers to break from a popular front would “prettify” their consciousness because they are so besotted with bourgeois nationalism and democratic illusions that it doesn’t matter that their mass organizations are chained to a class-collaborationist coalition. And let’s not forget Roman Catholicism. According to Workers Vanguard and Espartaco, “undoubtedly the majority of those who support the PRD also identify, in one degree or another, with some of the reactionary Catholic values that the PAN prominently pushes.” On what basis have these self-appointed experts in religious sociology made this determination? Never mind the long tradition of bourgeois anti-clericalism in Mexico, or that PRD supporters repeatedly clashed with Cardinal Norberto Rivera at the doors of the Metropolitan Cathedral on the edge of the Zócalo. When you add it all up – nationalism, democratic illusions, Catholicism – for the ICL, Mexican workers are just too damn backward to have a popular front. This is imperialist arrogance masquerading as Marxism. “The mass of workers and radicalized youth who participate in defensive struggles no longer identify with the ideals of communism,” pontificates the spokesman of the GEM, even as red flags proliferate in Oaxaca. This is what the bourgeois press said over and over about the French youth revolt last spring, and it is a mantra that the ICL has been repeating all over the world in order to justify their abstentionist policies. These deserters from Trotskyism claim that the key thesis of Leon Trotsky’s Transitional Program – that the historical crisis of humanity is reduced to the crisis of proletarian leadership – is outdated, because it supposedly “predates the present deep regression of proletarian consciousness” with the destruction of the Soviet Union. At issue now is not so much the leadership but “the working classes across the world,” dixit the ICL in its revised “Declaration of Principles and Some Elements of Program” (1998). In Bolivia, where worker-peasant uprisings toppled two governments in two years, the ICL goes so far as to assert that the Internationalist Group and League for the Fourth International “conjure up a proletariat where it barely, if at all, exists” (see “Spartacist League Disappears the Bolivian Proletariat,” The Internationalist No. 24, Summer 2006 for our refutation of this anti-Marxist idiocy). In the ICL’s idealist fantasyland, the Bolivian workers’ consciousness evidently regressed so far that they ceased to exist as a class. We are waiting with baited breath for the GEM to inform us that in there is no working class in Oaxaca as well, where the GEM has been notably absent in three months of a convulsive teachers strike (except for a brief foray as part of a national student congress). The other main argument of the GEM/ICL for why there is not and cannot be a popular front in Mexico is that there is no mass workers party. The popular front “refers to the political subordination of the mass parties of the working class to the capitalists,” decrees the ICL. “In Mexico, such a party of the working class has never existed, not even a reformist bourgeois workers party in the style of British Labourism.” So since Mexican workers have been incapable of producing a Labour Party, they can’t have a popular front either. But the entire premise is false. Where did Trotsky, author of the definitive Marxist analysis of popular frontism, declare that popular fronts are limited to mass workers parties? In none of these countries – not in China, India or anywhere in Latin America – were there mass workers parties at the time Trotsky wrote these lines. For that matter, the ICL for decades referred to popular fronts in El Salvador, Algeria, South Africa and elsewhere in semi-colonial countries where there were no mass workers parties. The latter-day ICL’s redefinition of the popular front, denying its applicability to most of the so-called “Third World,” was invented to attack the Internationalist Group (see “Declaration of the Permanent Revolution Faction,” The Internationalist No. 5, April-May 1998). But the issue is not just semantic, a dispute over definitions. At bottom, what’s at stake is whether revolutionaries fight for working-class independence from the class enemy. The Grupo Internacionalista and the League for the Fourth International call on Mexican workers to break with the bourgeois popular front around the PRD. The Grupo Espartaquista and the ICL do not, on the spurious grounds that to do so would “prettify” the consciousness of the Mexican workers. These pseudo-Trotskyists dismiss the powerful Mexican proletariat as hopelessly mired in nationalism and Roman Catholicism, rather than intervening in the class struggle to break the organizational and ideological chains of subjugation. A second theme of the Espartaco/Workers Vanguard attack on the Grupo Internacionalista and the League for the Fourth International is the GEM/ICL’s shameless apology for the corporatist pseudo-unions in Mexico. These instruments of state control of labor are inherited from the semi-bonapartist regime of the Institutional Revolutionary Party which ran Mexico from 1929 to 2000. Beginning under the rule of Plutarco Elías Calles, the PRI and its predecessors erected a corporatist regime, borrowing organizational forms from Mussolini’s Italy. (The 1931 Federal Labor Code was literally modeled on its Italian fascist counterpart.) But in semi-colonial countries with weak national bourgeoisies, the political content of these forms varied, as capitalist governments often have what Leon Trotsky called a “bonapartist sui generis” (unique or distinctive) character. That is, they can govern by chaining the workers under a police dictatorship or they may maneuver between the imperialists and a relatively strong proletariat, even offering concessions to the workers (like Mexico’s oil and rail nationalizations). Evolving from semi-state institutions under Cárdenas, during the course of World War II and through the post-war “red purges” carried out at the behest of the U.S. government, the CTM unions became thoroughly integrated into the capitalist state. By the 1950s, quantity had turned into quality. Union leaders were henceforth named directly by the PRI-government, labor militants (not only Communists) were fired by the thousands and many jailed for years, the CTM “labor” federation engaged in systematic strikebreaking and maintained squads of pistoleros to assassinate union oppositionists on a mass scale. Over the next half century, virtually every major labor struggle in Mexico (teachers in 1956-58, railroad workers in 1958, electrical workers in 1976-76, garment workers in the mid-1980s, miners and steel workers in 1989, maquiladora [free trade zone] workers from 1983 on) has been directed against the charro (corporatist) “sindicatos” which claimed to represent the workers but were actually labor cops for the bourgeoisie. The fundamental characteristic of corporatist “unions” is that they are part the machinery of a corporatist bourgeois regime which regiments every sector of society, sometimes buying popular support by throwing some crumbs to labor rather than simply repressing workers as under the Pinochet dictatorship. Such corporatist apparatuses are not unique to Mexico, but can be found in a number of semi-colonial and intermediate capitalist countries with bonapartist and semi-bonapartist regimes. In Algeria and other African countries where a single-party regime arose after independence, there were similar labor groups among the mass organizations of the state party. As the single party loses its control, its labor apparatuses are thrown into crisis and independent unions are thrown up or break away. In Argentina under Juan Domingo Perón from the mid-1940s to the early ’50s, another example of a bonapartist sui generis regime such as Trotsky analyzed in Cárdenas’ Mexico, workers unions led by Communists, socialists and anarchists were taken over or destroyed and replaced by labor organizations under the control of the government labor department. Likewise, in Brazil under Getulio Vargas in the 1930s and ’40s and again under the 1964-1985 military dictatorship there were corporatist government-controlled “unions,” which gave rise to huge struggles for independent unions. Our comrades of the Liga Quarta-Internacionalista do Brasil participated in the 1980s strikes and in the early years of the Workers Party (PT) which grew out of them, while opposing the PT-led popular front from 1989 on, which in 2002 made ex-corporatist labor faker Luiz Inácio Lula da Silva president to dismantle workers’ gains. The ICL and its Mexican offshoot refuse to recognize this in large part because they seek to force the Mexican reality into the framework of American trade-unionism, derived from an imperialist economy which occasionally throws some crumbs to a labor aristocracy. Corporatist unions such as in Mexico, Argentina, Brazil and Algeria have never existed in the U.S., nor could they in any imperialist country, except under a fascist/bonapartist dictatorship. On the other hand, a Labor Party on the British model is well-nigh impossible to build in an impoverished semi-colonial capitalist country, yet popular-fronts and popular-frontism can be found in most “Third World” countries that have a proletariat. 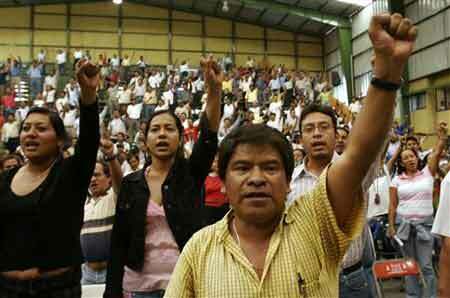 The issue of corporatism underlies the recent mine and metal workers’ strikes in Mexico. In late February, after a mine disaster at Pasta de Conchos in the state of Coahuila in which 65 miners were buried alive, the charro “union” leader, Napoleón Gómez Urrutia, under pressure from the survivors and families, criticized the mine operator, Grupo Mexico, of “industrial homicide.” Gómez Urrutia is a lawyer who inherited the leadership of the National Union of Mining and Metallurgical Workers of Mexico (SNTMMRM) from his father, Napoleón Gómez Sada, and was installed by the federal labor ministry in 2001. 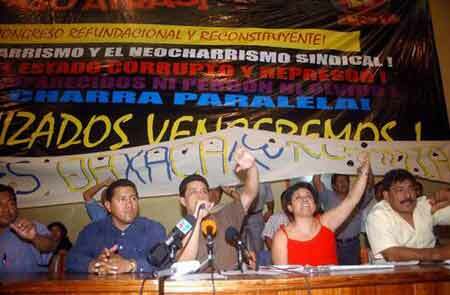 But the Fox government, closely tied to the mine bosses, would not brook any criticism by its puppet “union” chief, so it dumped “Napito” in favor of a more pliant pawn, Elías Morales. This unleashed a national strike involving several hundred thousand mine and steel workers. The SNTMMRM is no defender of the workers. It was co-responsible for the Pasta de Conchos miners’ deaths, having routinely signed off on the safety inspections in the notoriously unsafe mines. Relatives told reporters that the union and the company “are the same thing.” The government-installed “union” chief Gómez Urrutia was no less an instrument of the bosses than his government-installed replacement, Morales. But all class-conscious workers would object to the attempt by the capitalist state to name and remove leaders of what claim to be labor unions. The Grupo Internacionalista defended the miners’ strikes and urged other sectors of the working class to go out on a national strike against all government interference and for class independence from the bosses. At the same time, the GI called for the formation of independent workers committees to break with corporatism and forge class-struggle unions (see “Capitalist Murder in Pasta de Conchos,” El Internacionalista/Edición México No. 2, August 2006). The SNTMMRM chief called the strikes off after a couple of days, leaving some of the most militant locals (Sicartsa in Michoacán, Cananea, Agua Prieta and Nacozari in Sonora, Sombrerete in Zacatecas) to go it alone. Under Gómez Sr., strikes by these same locals were repeatedly sabotaged by the national “union.” Yet the GEM now declares: “The GI didn’t even defend the miners union against state attack! In accordance with its adaptation to the PRD, this group claims that the unions affiliated with the PRI – like the miners union – are not workers organizations, but the ‘class enemy’ (El Internacionalista/Edicion México No. 1, May 2001).” The Espartaco article goes on to say that this “would also apply to the SNTE and its Section 22 in Oaxaca.” It conveniently doesn’t mention that the Oaxaca teachers themselves have been in revolt for years against the national SNTE (National Union of Education Workers), which has emphatically opposed the Oaxaca strike, is financing a group (the CCL) that is scabbing, and now supports sending federal police and troops against the strikers. Interestingly, the CCL is led by prominent supporters of the Oaxaca PRD, whose leaders have also called for sending federal forces to smash the strike. The decay of the corporatist system of the PRI is behind the explosive struggle by the Oaxaca teachers. The president of the national “union,” the SNTE, Elba Esther Gordillo, was appointed by the Secretary of Government at an all-night meeting in the secretariat, after her predecessor (Carlos Jonguitud, also a PRI flunkey) had been “resigned” hours earlier in a meeting with President Carlos Salinas de Gortari. 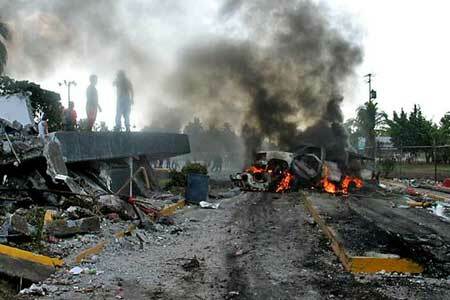 Between them, Gordillo and Jonguitud are responsible for ordering the assassination of more than 150 SNTE dissidents. Lately, with the PRI’s power eclipsed, Gordillo transferred her institutional allegiances to the Fox regime, and set up a new “party,” the PANAL (National Alliance Party), to support the PAN candidate Calderón. Section 22, on the other hand, is a key component of the breakaway CNTE (Coordinating Committee of Education Workers), which grew out of a revolt by teachers in Oaxaca and Chiapas 20 years ago. In many ways, the CNTE and Section 22 function as a separate union, calling statewide teachers strikes and national mobilizations of up to 500,000 teachers, directed against the national SNTE and the government’s Education Secretariat where SNTE chief Gordillo & Co. generally select personnel and set policy. 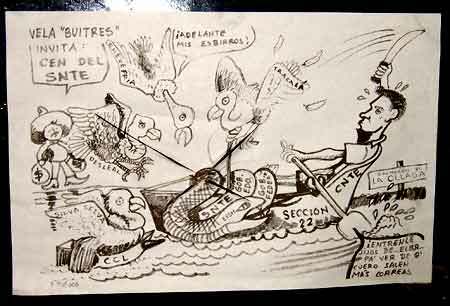 In the current Oaxaca strike, one can see numerous cartoons lambasting the national union, such as the one shown here portraying the SNTE, state and federal governments as a serpent headed by Gordillo (EEGM) while Section 22 and the CNTE are rowing the boat and fending off the vultures such as the CCL scabs egged on by the national SNTE leadership. To “defend” the SNTE and the other charro “unions” as the GEM does is to defend strikebreaking, and worse: murdering strikers. As a militant of the Grupo Internacionalista explained to the GEM membership attending our August 19 forum at the Museo León Trotsky, the main corporatist “union” present in Oaxaca City is the CROC (Revolutionary Federation of Workers and Peasants, in which the “Revolutionary” refers to its affiliation with the PRI). The CROC was set up some decades ago to provide a more militant face for the increasingly discredited CTM. But now it is gyrating wildly, siding with the PRD when it looked like AMLO would win the presidency, going over to the PAN after Calderón was declared victor, and acting as an instrument for PRI governors in several states. In Oaxaca, the CROC is a key component of the still-intact PRI regime which has ruled the state uninterruptedly for three quarters of a century. At the behest of PRI governor Ulises Ruiz, the CROC called a “strike” in December 2004 against the newspaper Noticias, the only local media to oppose Ruiz and support the teachers. Although the “strikers” didn’t even work at the paper, the government recognized their strike and a tent with CROC thugs has shut down the paper’s office ever since. “Thugs riding on pick-up trucks and SUVs, led by members of the CROC, also joined the officers from different police forces in their attack. In the face of this, residents of various neighborhoods and suburbs came into the streets and surrounded the radio station to join the defense and set up barricades with city buses, tires, rocks, sticks and other objects to prevent another attack. 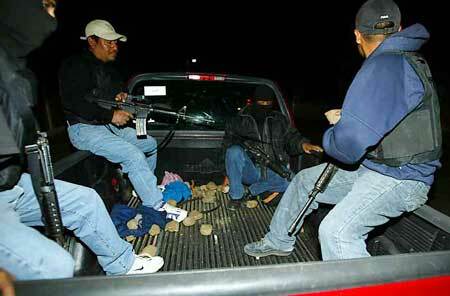 Above: Gunmen from the corporatist “labor” federation CROC participated in the “convoy of death” which drove around Oaxaca in late August shooting and killing strikers. Below: Strikers set up barricades to stop police/CROC death squads. And it’s not just the CROC. During a September 28 lockout called by the Oaxaca employers’ federation, there were plans to stage provocations which could then serve as an excuse for federal military and police intervention. La Jornada (29 September) obtained detailed plans for the operation, which include the following: “Four groups of PRI members affiliated to the CROC and the CTM, as well as police and municipal employees, are ready to attack businesses and passers-by, kidnap and burn vehicles, attack the population and news media, passing themselves off as members of the APPO.” The only reason this didn’t take place is that the lockout was a miserable flop, with barely 10 percent of the businesses shutting down. So when we insist that the corporatist so-called “labor” federations are not workers unions, but labor cops for the bosses and the capitalist government, this is no abstract question. They are literally on the other side of the barricades, firing on the strikers and dousing them with gasoline to burn them alive, organizing scabbing and seeking by every means to break the strike. This is what the GEM is defending and alibiing when it says it “defends the unions” like the SNTE, CTM and CROC. During the GEM’s brief foray into Oaxaca during the student congress in early September, we offered to take them over to the CROC tent so they could try to sell their paper to these “unionists,” but our offer was declined. The third strand of the threadbare GEM/ICL polemic against the Grupo Internationalista and League for the Fourth International is to accuse us of “renouncing the perspective of permanent revolution.” They tried this tack before, in 1997, when the supposed proof was that we insisted that Mexico was a capitalist country and not “semi-feudal” or having “feudal remnants” and “elements of the Spanish colonial feudal heritage” such as “feudal peonage.” We pointed out that not only is this false, it is precisely the line of the Stalinists, who use it to justify their call for a bourgeois-democratic revolution in Latin America. The GEM/ICL kept repeating this reformist canard for over a year, until it dawned on their principal leader that to talk of pre-capitalist survivals in Mexico was a “mistake” and anti-Marxist besides (see The Internationalist No. 5). Oh, well. 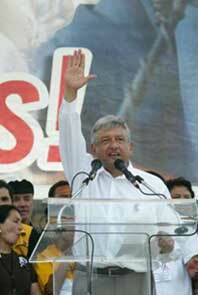 “Was there fraud in the Mexican elections? 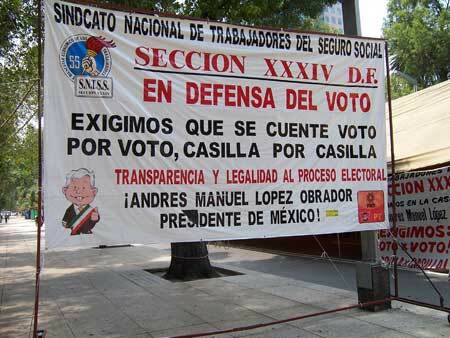 How could there not be?… Fraud in Mexico is not an aberration but an integral part of the electoral process. And not just in Mexico…. As Marxists, we give no political support to any of the competing capitalist parties and fight everywhere to organize revolutionary workers parties…. “Particularly in such a close and hard-fought election, where there are plenty of potentially suspicious elements, we support the demand for a recount, vote by vote, ballot box by ballot box – and not by the duplicitous electoral tribunal but in the light of day, before the population. 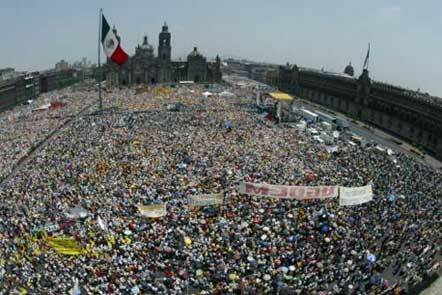 But while most of the left has enthusiastically climbed aboard the AMLO express, dropping earlier criticisms of the PRD candidate and instead calling to ‘defend the vote,’ the Grupo Internacionalista warns that at present the mammoth marches called by López Obrador are in fact political rallies on behalf of his Coalition for the Good of All…. In the face of the repeated police and military attacks, we continue to call to break from the AMLO popular front and to build a revolutionary workers party, as well as for a “national strike against the murderous government” and for “workers defense committees, independent of all bourgeois politicians and parties.” So the GEM/ICL contention that the GI/LFI “rejects the struggle for democratic rights” falls flat on its face. After quoting pieces of the above, Espartaco pontificates: “The point is that the struggle in defense of the democratic rights of the rights of the population is not counterposed to the defense of the working class against a bonapartist threat: in fact, they are one and the same.” This formula has some weighty ambiguities. Certainly, for proletarian revolutionaries working-class struggle against a bonapartist threat includes the struggle to defend democratic rights. But bourgeois liberals and petty-bourgeois opportunists often seek to build support for a class-collaborationist popular front by posing the struggle in terms of democratic rights. In fighting against a threatened or actual coup, communists do not limit themselves to defending democratic rights but instead seek to lead the struggle to workers revolution. The GEM/ICL writes that “if López Obrador won the elections,” they would “defend his right to occupy the post” of president. Well did he, and do they? And when and how would they defend that right – by mass mobilizations in the streets of the capital such as we have just seen? They don’t say. The GI/LFI states that if the struggle departs from the electoral plane and leads to class battles in the streets, revolutionaries would fight alongside the pro-AMLO masses against the attempt to impose a government by military means, while we continue to call for a “workers and peasants government,” not an AMLO government. “Everywhere and always, wherever and whenever revolutionary workers are not powerful enough immediately to overthrow the bourgeois regime, they defend even rotten bourgeois democracy from fascism, and they especially defend their own position inside bourgeois democracy. The Trotskyists did not fight with the aim of restoring the Spanish bourgeois Republican politicians like Azaña and Companys to the offices they were elected to. Rather, they fought in the trenches alongside Republican soldiers against the Francoists – and against repression by the Stalinists and bourgeois Republicans – for the goal of workers revolution, the dictatorship of the proletariat. “[T]he Grupo Internacionalista warns that the threat of a future anti-democratic prohibition is being used, with considerable success, to gain sympathy and political support for López Obrador and the PRD, a bourgeois nationalist party…. While defending the elementary democratic right of any political party to run in the elections with whatever candidates it chooses (even in the case of the big capitalist parties), we point out that the workers, peasants and other sectors of the exploited and oppressed must not let themselves be hoodwinked by the electoral maneuverings nor place any confidence in any side in this dispute among the bourgeoisie…. Did the GI “reject the struggle for the defense of democratic demands”? Not at all. We said that we defended the right of any party to present any candidate it wanted, but that was not what was going on here. We pointed out that executive immunity is an anti-democratic guarantee of impunity for the capitalist rulers, one that had been used by the authors of the 1968 and 1971 massacres, and that this is quite distinct from parliamentary immunity, which protects legislators from arbitrary actions by those very same rulers. The GEM responds by saying: “We do not take a position on such precepts of bourgeois legislation in the abstract, but rather based on the interest of the working class in each concrete case.” In other words, they are not acting on a matter of principle but of political calculation, and what they see as the “interest of the working class” is that large numbers of workers supported AMLO as their candidate. 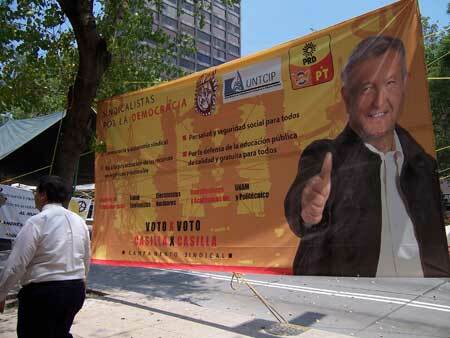 So the GEM gave AMLO backhanded support in the guise of defending his democratic rights. In any case, the verdict on this episode is in: López Obrador’s immunity was lifted, yet this did not prevent him from running in the July 2 election as the candidate of the PRD for president. Case closed. Over the last several years, in reaction to the counterrevolutionary destruction of the Soviet Union, the SL/U.S. and the other components of the ICL have turned sharply to the right and renounced a series of central Trotskyist programmatic positions. An important aspect of these revisions is that they take place, just when the issues become hot. It is a fundamental precept of Leninism, that in an imperialist war revolutionaries stand for the defeat “their own” imperialist bourgeoisie. In the United States, the SL for years called to “Defeat U.S. Imperialism!” notably in the Persian Gulf War of 1990-91. But amid the “anti-terrorist” war hysteria whipped up by the government following the 11 September 2001 attacks on the World Trade Center and the Pentagon, the SL/ICL dropped the call for defeat of “their own” imperialist bourgeoisie. On top of this, they added a sinister smear, accusing the Internationalist Group of “anti-Americanism” – literally, “Playing the Counterfeit Card of Anti-Americanism” – and being soft on Islamic fundamentalism, because we upheld the Leninist program of revolutionary defeatism toward imperialist powers engaged in colonial wars. Similarly, ever since the Vietnam War, the SL/U.S. had regularly called for transport workers to “hot cargo” (refuse to handle) war materiel during imperialist wars. They continued to do so up to September 2002, just as the Pentagon war machine was going into high gear shipping military goods to the Near East out of West Coast ports. Yet the minute the U.S. government slapped a Taft-Hartley injunction on the ILWU dock workers, alleging that a walkout could affect the war effort, the SL abruptly dropped the call for “hot cargoing.” After much flim-flam and accusing the IG of “rrrevolutionary phrasemongering,” they finally admitted that they dropped this call for proletarian action against the war, as they had earlier dropped the call for workers strikes against the war, blaming it on the backward consciousness of the workers. In Mexico, we have pointed out that the GEM had called since its inception in 1990 to break with the popular front around the PRD. But after expelling youth cadres in late 1996 who subsequently founded the Grupo Internacionalista, suddenly in May 1997 the GEM declared that there was no popular front in Mexico. Not coincidentally, this discovery took place just as the PRD was about to win the elections for the government of the Federal District. The GI published an open letter to the GEM, titled: “To Fight the Popular Front, You Have to Recognize That It Exists.” Amid the wave of popular support for the PRD, the GEM didn’t want to fight for the workers’ organizations to break from the popular front. And last year, responding to the groundswell of support for presidential hopeful López Obrador in the “hip” Mexico City petty-bourgeoisie it orients to, the GEM hitched its wagon to the popular front in the name of “defending democratic rights” when no democratic right had been attacked. 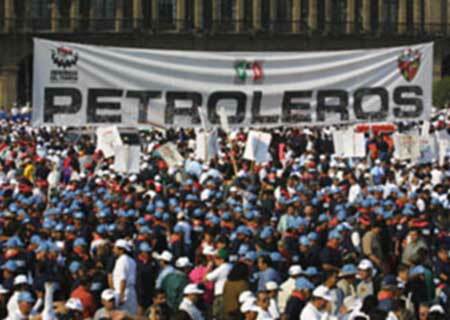 Today, the issue of corporatist unionism in Mexico is a burning question. The PRI-government monolith has cracked, right-wing clericalists are in power and the bureaucrats who were cogs in this apparatus for state control of labor are flailing about. Some (like the SNTE’s “moral leader” Gordillo) have cast their lot with the PAN’s Fox and Calderón, others (like the dynastic head of the SNTMMRM, Gómez Urrutia) have made timid criticisms of the bosses, and still others (like Vega Gallina of the SNTSS) have gone over the PRD. At the same time, the CTM is headed by Josaquín Gamboa Pascoe, who is not just any old corporatist labor boss but headed the gang of pistoleros that under the orders of the eternal CTM chief Fidel Velázquez destroyed the combative union at the Pascual bottling plant by gunning down union militants. The Congreso de Trabajo (CT), the umbrella group for the corporatist labor groups, meanwhile, is led by Víctor Flores Morales, who presided over the destruction of his own union and the firing of tens of thousands of railroad workers, while growing rich off proceeds of the privatization of the nationalized railways. In the middle of this agitated situation, miners and steel workers strike against government intervention. The corporatist “union” chief sends them back after three days, leaving the militant locals to strike alone for months. The Cananea strike loses, the Sicartsa strike wins, but no thanks to the SNTMMRM, which didn’t lift a finger to aid them. The Oaxaca teachers then undertake a militant strike which turns into a generalized revolt of the poor, indigenous and working people of the entire state. Now is the time to wage an aggressive campaign to definitively bring down the crumbling corporatist edifice and build genuine class-struggle unions, as the Grupo Internacionalista has been insistently calling for. So what does the GEM do? While complaining that the GI has “dedicated pages upon two-column pages to documenting the betrayals of the past and present bureaucracies of the miners union” (none of which they deny), the GEM “defends” the SNTMMRM without a word of criticism of the government-imposed labor boss Gómez Urrutia. While ridiculing the GI’s call for a national strike against the murderous government, the only action the GEM actually advocated was the phony “national work stoppage” for June 28 that was bandied about by the CTM/CT tops only to be called off, as they always do, saying the timing (right before the July 2 election) was not “opportune”! And then these pseudo-Trotskyists denounce the GI for saying that the SNTE is an instrument of the class enemy for controlling labor precisely at the moment when this apparatus is doing its level best to bust the Oaxaca teachers strike, while CTM/CROC gunmen are murdering strikers. These “CTM socialists” are now effectively apologizing for death squads. And yes, Stalin killed several million communists, but the USSR remained a bureaucratically degenerated workers state because it rested on the proletarian economic basis of collectivized property. The CTM/CT/SNTE and the rest of the corporatist apparatus do not rest on workers organizations, they rest on the capitalist state, which directly provides most of their finances, while imposing and deposing their leaders at will, and dispatching their goon squads to engage in strikebreaking at gunpoint. But, in fact, the CTM, CROC, CT, SNTE and the rest of the corporatist labor apparatuses literally conduct struggles against strikes and against raising wages, while organizing scabs, murdering union militants and exploiting the labor of contract workers while their leaders not only enrich themselves with graft but become actual capitalists. In short, by Trotsky’s criteria and a Marxist, materialist analysis, these are literally “organizations of scabs,” not workers unions. This certainly gives an idea of the political pressure the GEM is capitulating to, which is real indeed. But in distributing leaflets and selling papers with headlines on “The Attacks of the PAN,” these centrists are not swimming against the stream but going with the flow of the AMLO popular front.